I'm still debating if I should do a nutritional analysis on this. Maybe I'll wait until it's gone and the damage is done. Someone made a request for a special occasion, and I had a blast accommodating him, with ... chiffon. You'll often see this pie made with whipped egg whites instead of the whipped cream I used here. I was going for the melt-in-your-mouthfeel and a blooming depth of flavor, fat be damned. 1 Preheat oven to 340ºF. 2 Grind the cookies in a food processor. Wear earplugs if you're sensitive to loud noises. 3 Mix the crumbs and sugar in a medium bowl. Add the melted butter and mix until combined. Add the ginger root and mix until distributed. Press crumbs firmly along bottom and sides of a 9-inch glass pie dish. Bake for about 8 minutes; remove before it starts to darken in color. Cool. Note: The crust can be made a day or two in advance of the filling. In fact, it's preferable to make it ahead since you want to fill a completely cooled and chilled crust. 1 Find a bowl big enough that a medium-sized saucepan can rest inside, along with a few cups of ice water. It's a good idea to use a metal bowl since it may experience wide changes in temperature suddenly. Add ice cubes and about 1 cup of water to the bowl. Set aside. 2 Sprinkle gelatin over 1/4 cup water in a small bowl. Let stand for 10-15 minutes to soften. 3 Whisk together lemon juice, sugar, egg yolks, lemon zest, and salt in the medium-sized saucepan. Heat slowly at a low temperature, whisking constantly, for about 8 minutes or until you just begin to see the sauce gurgling. Don't let it boil! Try not to let it rise above 160ºF. 4 Whisk in the softened gelatin until it's dissolved, about 1 minute. 5 Immediately place the warm saucepan into the bowl of ice water. Whisk every minute or two for about 10 minutes until filling has cooled. Transfer the cool filling to a large bowl and set aside. Note: Be prepared for a little ice water overflow. One way to avoid this is to place the sauce pan into a bowl of just ice and carefully pour water into the bowl until it comes up the sides. The danger here is in contaminating your lemon curd with water. 6 Beat chilled whipping cream with powdered sugar in a chilled bowl using a chilled whisk until soft peaks form. Gently fold a few scoops of whipped cream into lemon filling until mixture is one color. Fold in the remaining whipped cream in stages, trying not to over-mix. Pour lemon filling into chilled crust, as much as will fit. 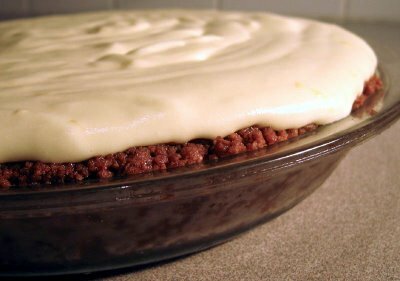 Refrigerate pie for several hours until firm. Let stand at room temperature for about 20 minutes before serving. Note: Don't worry if, as you pour filling into crust, it looks like it will creep over the sides. Pour slowly into the center and allow the filling to mound. The gelatin will set it into the shape you've poured. Pour any remaining filling into a small bowl, refrigerate it along with the pie, and sneak spoonfuls of it whenever you open the fridge.